The Excellence in Teaching Award has been awarded annually since 2005 but beginning this year, the prize will be awarded each semester in an effort to recognize more professors for their contributions. 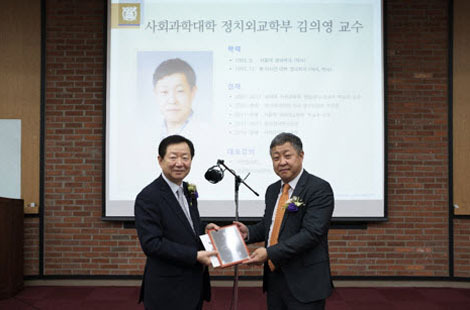 This year’s recipients are: Professor Kim Hyon-Jin (Department of English Language & Literature); Professor Kim Euiyoung (Department of Political Science and International Relations); Professor Kim Myung-Hwan (Department of Mathematical Sciences); Professor Seok Yeong-Jae (Department of Biological Sciences); Professor Kim Sung June (Department of Electrical and Computer Engineering); Professor Jeon BongHee (Department of Architectural Engineering); Associate Professor Sonya N. Martin (Department of Earth Science Education); Professor Kim Yong Sik (Department of Pharmacy); Professor Ahn Dukgeun (Graduate School of International Studies); Professor Hwang Lee Seok (Department of Business Administration). Professor Kim Euiyoung (Department of Political Science and International Sciences) demonstrates an exemplary case of community-based learning through his class “Civil Politics.” He encourages his students to observe the world outside of the classroom and to discover and analyze civil politics in their communities, and through participation, realize their responsibilities as democratic citizens. 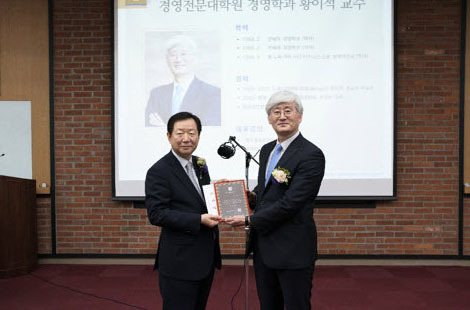 Professor Kim also collaborates with local government organizations and administrators, the press, and other organizations and is a large part of SNU’s societal contributions. Professor Kim Myung-Hwan (Department of Mathematical Sciences) has focused on teaching mathematics tailored to diverse groups of students. 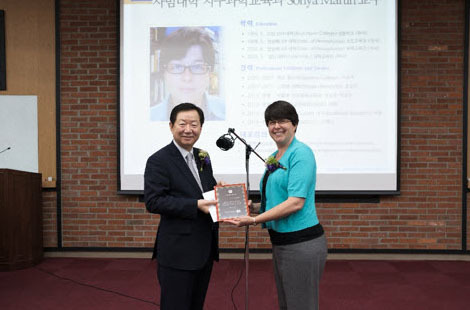 Interested in spreading the knowledge of math beyond the mathematics department, Professor Kim has taught “Civilization and Mathematics,” which introduces humanities and social science students the meaningful role that mathematics has played throughout played human history. He also teaches “Modern Algebra,” a course in which he has changed the curriculum to include simplified examples simplified of complex, abstract algebra to make them more easily understandable to students who may be unfamiliar with the concepts. And for students who lack the mathematical background for certain cryptology classes, he has developed a new class called “Mathematical Coding,” and has created his own textbook material for the class. 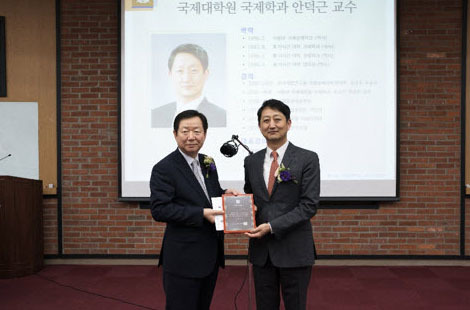 Professor Seok Yeong-Jae (Department of Biological Sciences), whose specialty lies in microbiology, has promoted student learning by updating the textbooks and restructuring the existing curriculum. In his biology laboratory classes, he encourages the increased participation of graduate assistants in order to enrich the classroom environment. He has also revised and edited various curricula within the department to minimize overlaps in material. Professor Seok teaches “Microbiology” and “Microbiology Special Lecture,” courses in which he blurs the lines between various traditions of thought, encouraging students to approach the topic in new ways. 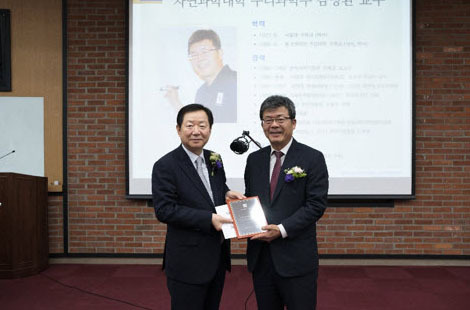 Professor Kim Sung June (Department of Electrical and Computer Engineering) is at the forefront of neutral prosthetic engineering research in Korea. 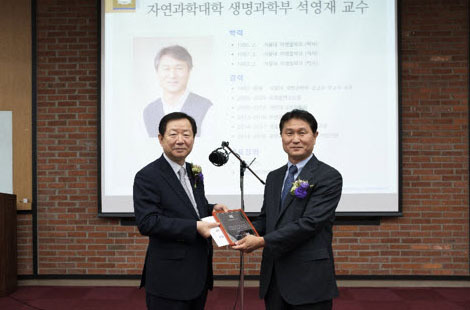 He has created several pioneering classes at SNU, including “Neurosecurity Technology,” “Biometrics,” and “Advanced Bio-electronics.” He has also developed English lectures, remote lectures, and simultaneous lectures in which he taught at both the University of Tokyo and SNU, utilizing new technology to reach beyond the traditional classroom. Furthermore, he has actively incorporated tutoring programs and study group support systems to help students that need academic assistance. 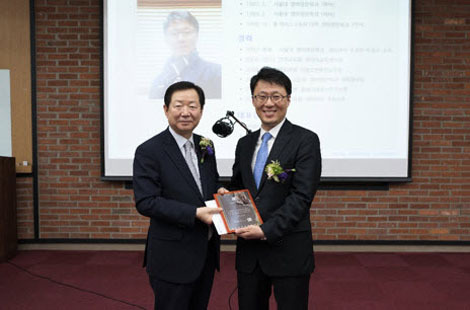 Professor Jeon BongHee (Department of Architectural Engineering) specializes in architectural history, teaching courses such as “A Walk Through Modern City Architecture,” “Research Methodology of Korean Architecture History,” “City and Architecture of Asia,” and “Wooden Constructions Studio.” In the “Wooden Constructions Studio” class, Professor Jeon was the first to incorporate Hanok (Traditional Korean house) building into the course. He expanded the research and perspective of architectural history, which had been primarily focused on modern architecture, to include East Asian architecture, contemporary architecture, and practical applications. He established an architectural archive here at SNU and has planned several architectural exhibitions. Through his research and writings, Professor Jeon has contributed tremendously to the mission of propagating the knowledge of Korean architecture. Associate Professor Sonya N. Martin (Department of Earth Sciences) fosters open communication and debate with her students in order to encourage their self-discovery and the development of their competence as science educators. She has hosted the “Science Fair for All Students” at SNU, inviting teachers from various schools, which allowed pre-service teachers an opportunity to hold interviews and learn about the diversity of learners and teachers. And through the publication of the webzine “iSNUCE,” she has interacted with and helped international students studying at SNU, which has earned her the title of “big aunt” among the students. 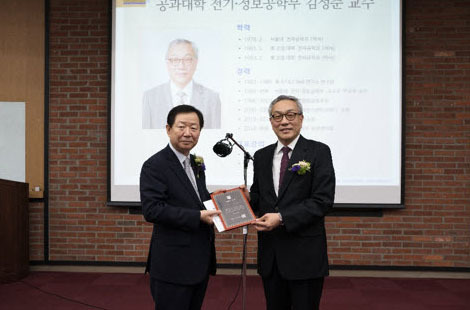 Professor Kim Yong Sik (Department of Pharmacy) has been a part of the SNU faculty for 30 years, teaching classes such as “Development of Medicine,” “Health Functional Foods and Cosmetics,” “Natural Medicine,” “Misuse of Natural Substances,” and “Natural Products Chemistry.” Professor Kim incorporates diverse media – including video, film, and current events – into his curriculum to pique student interest and experiment with different learning methods. He has also worked on creating new textbooks that reflect student interests. Professor Ahn Dukgeun (Graduate School of International Studies) approaches the subject of international trade from various academic perspectives including those of economics, law, and policy, and with this broad approach, reaches out to students of all backgrounds. He teaches both historical and current issues for comparative discernment and analysis. 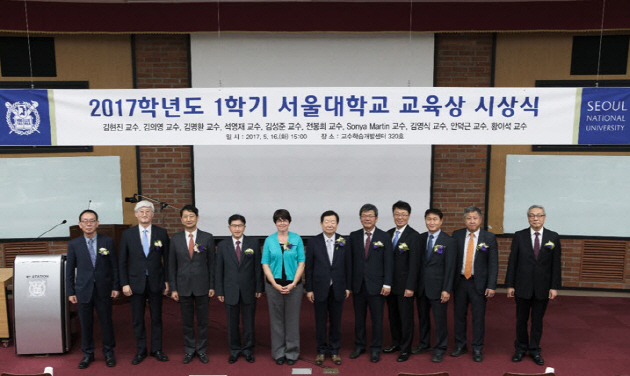 Professor Ahn has also helped establish the FTA Master’s program and the SNU in Switzerland program. 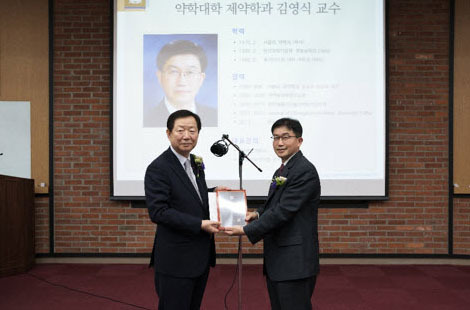 Professor Hwang Lee Seok (Department of Business Administration) fosters competence in accounting within students of diverse backgrounds by tailoring the curriculum to their specialties and interests. With his undergraduate students, he provides cases of corporate strategies and selects content that aids them in choosing their future career paths. With his graduate students he improves their research skills, incorporating research topics and methodology into his lectures.